Is unique in exploring the landscape of Midlothian in depth — the geology, the flora and fauna, illustrated by fascinating antique maps. It was this landscape that supplied the pink, yellow and grey stone for Rosslyn Chapel, cut from the ancient wildernesses of Roslin Glen. Explains in detail what few have done before — the daily life of the priests and choirboys at Rosslyn Chapel, one of 40 collegiate churches set up as powerhouses of prayer and song — some of the music still happily preserved in major libraries across Europe. Makes clear the central role of the Scots scholar Fr Richard Augustine Hay, related to the Sinclair by marriage, and involved in the strange but brief years around 1688 when King James VII set up a Roman Catholic Chapel Royal at Holyrood, a printing-press and a school and Fr Hay took part in the services. Explores the landscape of Midlothian from Temple village (home of glass artist and clarsach player Alison Kinnaird and folk musician Robin Morton, and once home to painter Sir William Gillies and author George Scott-Moncrieff), to Soutra Aisle and the unique ecumenical community of the Transfiguration. Uncovers the role of Sir Walter Scott in increasing the Chapel’s reputation for mystery and the ways in which successive poets, painters and photographers celebrated the extraordinary design of the Chapel. Ends with a new mystery, a challenge to its readers to uncover the truth behind an act of sacrilege committed in the Chapel in the 1470s, the answer to which lies in the Secret Vatican Archives in Rome. The Apprentice Pillar (also known as the ‘Prince’s Pillar) is a story found at a number of other medieval churches in Britain and the Continent. Interviews with 3 working stonemasons and an apprentice mason (at St Mary’s Episcopal Cathedral Workshop, Edinburgh) show that no apprentice would have the skill to carve such a pillar that would take a year to complete. Knights Templar the Sinclair family were Crusaders (fighting to free the Holy Land). Templars had to swear vows of poverty, chastity and obedience. The Sinclairs were married, well-to-do and vowed allegiance only to the King. American Corn two academic botanists with PhDs are quoted as finding no evidence of any specific botanical specimen in the decoration of the Chapel, apart, perhaps, from Hart’s Tongue Fern, an ancient plant that still grows in Roslin Glen. Freemasons Freemasonic images were added to the Chapel in the 1860s when the Fourth Earl of Rosslyn, Grand Master Mason of Scotland, commissioned the architect David Bryce to ‘restore’ the Chapel. He took out a number of damaged stone ‘bosses’ in the Lady Chapel and replaced them with new, quasi-masonic carvings. 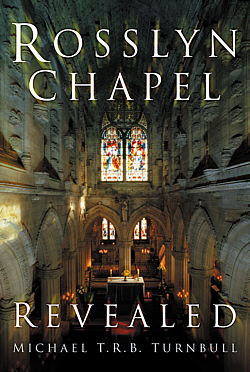 All these facets of Rosslyn Chapel are profusely illustrated with some 30 colour photographs and 200 black and white images, as well as copious footnotes substantiating all the evidence provided in the book, a detailed index and a contact list of useful organisations.